Create the best ASMR for YouTube with equipment that’s perfect for you. At least take a look! The guide is a beast. Even if you’re not making ASMR, but you are putting some gear together that might be similar (blogging/streaming), this guide is also for you. My guide is dedicated to help you build the best recording setup for a variety of budgets, for ASMR, YouTube blogging, and anything similar. I’ll be covering the best microphones to record ASMR with, a few of the best cameras for YouTube, other useful equipment, plus tips to set things up and eliminate unwanted noise. There are navigation jumps everywhere for easy movement and lots of videos to keep you entertained. Enjoy. Some time ago I wanted to start making YouTube videos and I did a ton of research chasing down the appropriate gear for my budget. I watched a lot of different creators talk about their gear, their software, and their journey as creators. In the end my passion was more for doing the research and writing guides than posting on YouTube, even though I do now have great gear for that. Anyway, I get a lot of satisfaction from helping people find what they need so it all worked out fine. I’ve been into the ASMR scene for a few years now. I first wrote something about it ages ago, then I started writing about creators and took an interest in their journeys and the evolution of their gear. Of course a lot of ASMRtists are interested in each other’s gear so it just made sense to find out as much as possible and throw it all together in one place. The result is this guide. I will try to update it as time goes on to keep it current so do check back from time to time. Okay. Intro over let’s start from the very beginning. You need a plan, right? It doesn’t take a lot to record an ASMR video. Or any video for YouTube. The biggest YouTubers all started out with pretty bad gear, as they demonstrate in their own videos aimed at budding content creators. In fact, let’s start by showing you one of the most important YouTube videos for creators ever made. This is Casey Neistat, who, as I write this, has around 10 million subscribers. In case you thought that video was a fluke, Jenna Marbles made a similar one with a lot more swearing in it. To summarise that four and a half minutes, “just make your videos”. At time of writing Jenna has 18 million subscribers. Jenna Marbles and Casey Neistat both drive home the point that when you’re starting out, the best gear is whatever you’ve got. That could be your smart phone or a webcam with built in microphones or something else that’s humble like that. If you’re making something lo-fi, low quality gear could even be preferable. Making the best ASMR is about creating a particular human experience. Even so, there are ASMR artists spending a lot of money on gear. You may yourself, already be looking at the next step up. Crisp, clean sound capture. No electrical buzzing. No computer fans being recorded. That magical binaural sound perhaps? Let’s look at the main points to consider. 1) What Are You Recording On? Before considering your microphone and camera, you need to consider the device you’ll be recording on. This might be a camera, a recorder, a computer, or perhaps a tablet or smartphone. Did I miss anything? Pretty much if you can record sound on it, get that audio into editing software if you need to and then upload it to a place like YouTube, you’re good. So, a lot of these options are already silent devices. If your recording device is silent, then great! No problems. However, if you are planning to use a noisy computer with internal fans that you can hear, then you might have issues with those noisy fans making onto the recording. Yeah, not so good right? To get around that you can try shielding the computer (putting it somewhere the fan noise won’t be picked up by the microphones), or you can try fan control software such as SpeedFan to slow the fans down to the point they spin silently. It’s free software. Check out SpeedFan in the Software section if that sounds useful because it could really help you out without costing you any money. The microphone section has more troubleshooting tips for eliminating common unwanted noises before or after you buy. If your microphone is picking up some odd noises, check out that section before throwing the mic away! 2) What Microphone Do You Need? This is probably the number one question for ASMR artists. Of course really it should be the number two question, like it is here, because… well your mic options depend a lot on what you’re recording on. Some mics like the Yeti have a USB connection, so you wouldn’t be able to plug it into the Zoom H4n or a camera, you need to plug it into a computer’s USB slot. 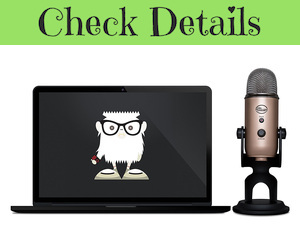 USB mics like the Blue Yeti are frequently recommended starter mics, so I’ve noticed, because really if you have a laptop then you can do all your recording and editing in one place. Nice! The Yeti is also used by veterans who really happen to like the Yeti. Advanced microphone setups such as microphone matched pairs require recording devices to go with them, and part of the reason for that is their power requirements. Some recorder microphones can supply this power, while also being microphones in their own right. Browse the different types of microphone and see what strikes you as the best type for your needs and budget. 3) What Camera Do You Need? It can be as simple as a smartphone or a tablet. Basic, yes, but fine for visual ASMR triggers, whispers, role plays and personal attention. Interesting niche actually. The next step up would be a really decent webcam plugged into a computer via USB, with the option to couple it with a really decent USB microphone. I’ve already gone over the possible need to silence a computer earlier if you go this route, plus I’ve watched ASMR videos recorded on laptops without noticing any noise from them so I know it’s completely possible. Computer noise might be even less of a problem if you were recording your video on the computer and the sound separately on a recording device some distance away. The relatively higher-end cameras and camera packages that I see being used by artists such as Gentle Whispering and Ephemeral Rift are things like the Canon EOS Rebel T7i. While technically still a mid-range camera, even those are over a thousand dollars counting lenses and accessories. I’d only recommend that kind of gear to experts and people who have more money than sense. I mean if you have the money, why not right? Buy five and have multiple angles! I’ll end this section with a story. This one belongs to Gibi ASMR, who right now has over one million subscribers. It’s worth a listen. Buried under an avalanche of microphones and unable to pick the one you need? No problem. The microphone section is broken down into types of microphone starting at the simplest and ending with the most complex. A USB microphone will just work without being too fancy, while at the other end you have microphone pairs that are for experts. Of course, you can only start to become an expert in microphone pairs by buying some. My advice would be to read through the types of microphone and settle on one that you can both afford and grow into. It doesn’t need to be expensive. First off, there are a lot of USB microphones on the market. So many. I really thought I was going to have a headache sifting through a mountain of microphones with very similar capabilities until I read up on the Blue Yeti. This microphone must be as famous in the ASMR community as the 3Dio for very, very good reasons. It has many more relevant features for ASMRtists than the vast majority of the competition out there and so it has to be my top pick for this category. The next feature that’s amazing is the monitoring port for headphones, which allows you to hear exactly what you’re recording with zero latency, a must have feature for many artists. Without that feature you’re just hoping and praying that what you’re recording is good. All you do is plug in some headphones and you’ll be able to hear exactly what your listeners will hear. Most competing mics don’t allow you to do that, but the Yeti does. Create unparalleled recordings directly in your computer with Blue Microphone’s Yeti USB Microphone. The Yeti uses Blue Microphone’s proprietary tri-capsule technology to produce pristine, studio-quality recordings. It features four different pattern settings so you can record vocals, instrumental music, podcasts, or interviews in ways that would normally require multiple microphones. With simple controls for headphone volume, pattern selection, instant mute, and microphone gain, you’ll be creating exceptional recordings right out of the box. The overall construction of the Blue Yeti looks incredible, quite a large microphone, very easy to brush, tap and interact with. It’s also perfect for voice work, from whispers to normal speech. So you can podcast with it as well if you wanted. A very flexible microphone, and the price point is also frequently mentioned as being very attractive for everything that you get. Great value. If you’d like to hear the microphone in action, take a look at this video from Caroline ASMR. Caroline uses the Blue Yeti a lot and I have to say it sounds amazing and she gets really great results out of it. It’s funny because some people much prefer the stereo sound you get with the Yeti over the binaural options and it really goes to prove you don’t have to spend a lot to get into creating the best ASMR. The Blue Yeti microphone also comes in a lot of different colours, including newly released ones. Also because this is USB, you won’t need a specialist recording device, you just record on your computer, do your editing and then you’re done. Easy. If you do need a windscreen or pop filter for the Yeti, they are available. This particular one goes right over the top and you can tap it and scratch it and make some pretty cool sounds. Available in black, blue and silver. I actually really like the blue one. There’s also the mesh style that is good for many types of microphone and you get screening from the front and sides. I was determined to find at least one good competitor to the Blue Yeti for the USB category. Although I found the “quite good” Audio-Technica AT2020USB+ microphone, it wasn’t good enough to recommend to you for ASMR. Then I came across the Rode NT-USB Condenser Microphone, which is at least worth a look. Something to challenge the Blue Yeti? Let’s dig a little deeper. The NT-USB is a highly versatile side-address microphone that is ideal for recording singing and musical performances in addition to spoken applications such as podcasting and voice-over. It is fully compatible with all mainstream recording applications on both Windows and Mac OS based computers, as well as the Apple iPad using RØDE Rec, GarageBand, or any other recording app that accepts an external microphone. Use on the Apple iPad requires a suitable USB connection adaptor, such as the Apple Camera Connection Kit. The body of the NT-USB features a zero-latency stereo headphone monitoring (3.5 millimeter) jack, which allows you to monitor the microphone input in realtime, along with dials to adjust the monitoring level and mix between the computer/iPad audio and the microphone input. A premium pop-filter is included, which fits onto the base of the mic, positioning the filter the ideal distance from the capsule to minimise plosives (hard ‘B’, ‘T’ or ‘P’ sounds that produce a harsh sound) during singing or speech. 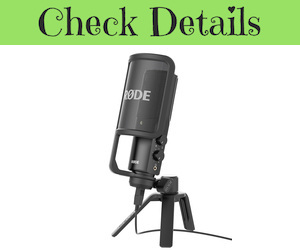 Also provided is a high-quality stand mount with industry standard 3/8 inch thread, desktop tripod stand that allows the NT-USB to sit at a comfortable height on a tabletop, and a pouch for storage of the microphone when not in use. Well okay. First thing’s first, what are you getting for an extra $40 compared to the Blue Yeti? People who own both microphones report that while the Blue Yeti has more features, the Rode delivers a higher audio quality. You also get a custom pop filter thrown in, so you don’t have to buy one of those as an extra. Great features worth noting on the Rode include plug and play (no drivers to install, just plug it in and it works) and that all-important headphone jack for monitoring what you’re recording. Overall I still think the Blue Yeti is the safer bet as the top microphone for ASMR in the USB category on price and features, but if you’re sold on the Rode’s higher quality as a studio mic then why not give it a shot. If you’re going to spend much beyond the cost of a Blue Yeti anyway, you should definitely check out Recorder Microphones. The first one is the Zoom H2n, which is both a recorder microphone and a USB microphone. Plus it’s a really good one. I’ll continue with the Zoom H2n in the next section (scroll down). You’re now entering a brave new galaxy of microphones. With these types of microphone you can record anywhere without a computer (eliminating computer noise, if you have that problem), and potentially future-proof yourself for microphone upgrades (because some recorders are much more than just a mic). The most common brands in ASMR are Tascam and Zoom. Zoom is currently stealing the show, with upgrades to familiar models such as the H4n that push it ahead of the competition. 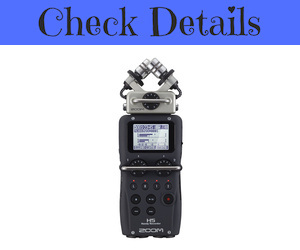 Zoom is the behemoth for recorder microphones in the ASMR community, manufacturing the ubiquitous Zoom H4n (Pro) microphone that doubles as something to record a 3Dio or high quality microphone pair. While the H4n Pro will hit the sweet spot for many artists, the other recorder microphones in the series worth looking at are the H2n, the H5 and the H6. If you want a “tl;dr” version of the comparison, it goes something like this. The H2n is a microphone that you can use anywhere and it doubles as a great USB microphone, but it doesn’t have XLR ports. The H4n Pro is the first model with XLR ports for those external microphones, while the H5 and H6 are more potent versions of the H4n Pro. The first of the family, the Zoom H2n makes a really interesting UBS microphone. It has a dizzying array of abilities beyond a Blue Yeti, including the ability of not even needing a computer. So you might not even use the USB. You can record audio straight to SD card while recording your video on an iPhone, DSLR or whatever, and then all you need to do is import both the audio track and the video track into your editing software. Sync them up and you’re golden. The major benefit of this type of setup is portability. You can take a recorder and portable camera just about anywhere without lugging a hefty computer with you. Plus there’s no noise from any of the equipment. It’s all blissfully silent. The quality from specialist gear like this is higher, so yeah, you’re entering a whole new level of ASMR production from trying to use a noisy laptop and basic recording equipment. The funny thing about getting a recorder is that it isn’t even that expensive for what it does. One of the H4n Pro reviewers on Amazon boasted that they used it in a Hollywood movie. And if you just did a double-take, right, I did too. But then that’s the kind of company Zoom is. It’s the company that professionals use. And this is the kind of gear that they use. You could have this gear. Once you’ve made up your mind, it’s just a few clicks away. Since I just mentioned the H4n Pro in such a glowing light, you might be wondering why you’d go with the H2n at all. Isn’t is worse? No, it has more built-in microphone capabilities than the H4n does and appears (after sifting through many comparison reviews and videos) to be the better stand-alone device. That’s right, Zoom have built more surround sound capabilities into the H2n and given it its own niche in the series. In particular, it’s the 4-channel surround sound and spacial audio capabilities that jump out of the official specs. Using “Spatial Audio” mode, you can create a single four-channel, multi-track WAV file that includes Omni, Left/Right, and Forward/Backward tracks. This Spatial Audio file is then ready to be combined with 360-degree VR videos recorded with the google JUMP compatible camera rig (such as the GoPro Odyssey or Ricoh Theta). Once completed, the immersive videos are ready to upload to YouTube. Intense, right? You could make incredible ASMR with such capability. 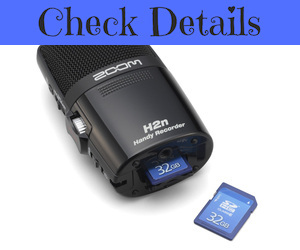 Overall the Zoom H2n is a very affordable killer device. Even if you also bought an H4n Pro for it’s XLR abilities, your Zoom H2n would retain it’s place in the sun forever. Definitely a great choice for your first recorder microphone. And also a great choice for your tenth. Records directly to SD and SDHC cards of up to 32GB. Supports up to 24-bit/96kHz WAV audio and MP3 formats up to 320kbps. Requires just two AA batteries. Wait, batteries? More than that, for power the Zoom H2n will also run on USB, a USB lithium-ion power pack or a USB AC adapter for extra stamina, automatically switching to the internal batteries if needed. It’s recommended to have another power source if you’re going to be pushing the microphone all day, since two fresh AA batteries will only last (in reality) around 6 hours. That’s still okay though. As with earlier mics such as the Blue Yeti, there’s a headphone port for you to monitor what you’re recording. That’s true for the later Zooms too, which is pro gear and you can expect that as standard now. While the full list of audio features may seem overwhelming at first, the Zoom H2n is an easy mic to get to grips with, while providing you with plenty of room to grow. Overall this is a very impressive piece of kit at a very reasonable price and it should last you a very long time. Listen to some more David play Larus sing if you still need convincing. And yes, I listened to all of their covers. All done with a Fuji X100S camera and a Zoom H2n audio recorder. Pretty cool. They make it look easy don’t they? You’ll love your own Zoom H2n. The most useful accessory is the highly rated windscreen. I mentioned earlier that the Zoom H4n Pro is a common piece of gear among growing ASMRtists. When I started following Pandora ASMR, it was right there being used as a microphone recorder for a 3Dio. Heather Feather (the legend herself) also uses the Zoom H4n. That seems to be a common use for it, not just for the 3Dio but for microphone matched pairs as well. However, that doesn’t mean you can’t use the Zoom H4n Pro as a microphone in it’s own right. Zoom have improved the mic over the years and the 2016 edition is especially silent. Clean, crisp audio for clear whispering without white noise in the background. The different wind guards are also fun to play with. Some like the fuzzy one to give you a kind of head massage, while others like touching and scratching the foam wind guard. Even without a guard, artists find ways to play with it with ear picks and other objects. Now it’s also super important to go over the Zoom H4n Pro as a microphone recorder. The XLR ports on the bottom of the Zoom H4n Pro allow you to take your ASMR to the next level with professional condenser mics that require phantom power. 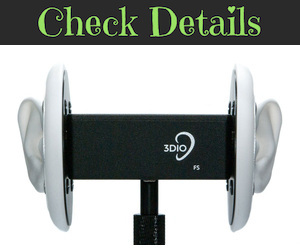 That includes mics such as the popular 3Dio (the one with the ears). Massage ASMR can show us how he has his Zoom H4n set up with a Rode NT-5 microphone matched pair. Overall the Zoom H4n Pro is a beast of a device. Relatively inexpensive, it allows you to record audio out of the box anywhere without an additional microphone or even a computer. It also gives you a clear upgrade path to professional grade microphones that require XLR and phantom power. The Zoom H4n Pro is an investment in your future. NEW. AND IMPROVED. Zoom H4n Pro. At Zoom we’re always developing new ideas to improve the performance and function of our Handy Recorders. With the H4n Pro, we’ve taken everything creators love about the H4n and brought it to the next level. The H4n Pro isn’t just improved, it’s superior in every way. With advanced X/Y microphones, incredibly natural-sounding preamps, and a super-low noise floor, you can record everything from the Indy 500 to the fluttering of a hummingbird with extraordinary realism. The H4n Pro provides the essential combination of mic’ing versatility, portability, and superior audio necessary for impactful storytelling. With support for plug-in power, you can use a lavalier to mic up your subject for podcasts or interviews. Record time-stamped WAV files to sync with video footage in post-production, or embed superior audio directly on your video in real-time through a ⅛” stereo feed. Music, film, something random like ASMR, whatever you like to do, this device has you covered. All this, at a great price. It’s obvious why the Zoom H4n is popular for ASMRtists. The reviews confirm it. You’ll love owning the Zoom H4n Pro. There’s an official fuzzy windscreen too. Adorable. So far the Zoom H2n has offered us a versatile microphone recorder and the Zoom H4n Pro has added XLR capability as the headline features. The upgrades to the Zoom H4n Pro in 2016 brought it very close to matching the H5. With the H6 still to come, what could the Zoom H5 possibly offer? There are numerous improvements on the H5 over the H4n Pro, the most obvious being the capsule system that it shares with the H6. Four tracks is two more than you’re likely to need, or is it? You could record the same events with two pairs of microphones and compare the results, easily discovering which setup is best. Or perhaps you need four audio sources for a particular effect. There are so many features in the Zoom H5’s wall of text that for the extra money over the H4n Pro there’s bound to be something that’s indispensable to each owner. Of all the reviews, videos and forums I looked through searching for a killing blow that the H5 was going to land on the H4n Pro, I didn’t honestly find one. The 2016 version of the H4n Pro provides the same quality as the H5, yet the H5 has numerous extended abilities over the basic H4n Pro. In the end it boils down to whether you’re going to find value in the extra versatility of the H5. Both recorders are excellent whichever one you go for. Uses a system of interchangeable input capsules that can be swapped out as easily as the lens of a camera. Includes detachable X/Y capsule (XYH-5) with extended signal capacity and shock mounted mics for reduced handling noise. Two mic/line inputs with XLR/TRS combo connectors each with selectable phantom power and -20dB pad. Runs on 2 AA batteries and records directly to SD / SDHC cards up to 32GB. Overall much the same as the H4n Pro with additional features for a little extra money. A highly rated device that buyers love. The universal fuzzy windscreen also fits the H5. The H6 is Zoom’s flagship model of microphone recorder. As such it’s probably overkill for the vast majority of ASMRtists, which is why so many buy the H4n Pro. But let’s say for a moment that you might be interested in overkill, because that’s just who you are. The Zoom H6 is a beast and you will love it. Here at Zoom we’ve been building innovative products for the past thirty years. But with the revolutionary H6 six-track recorder, the bar is raised further still. Four interchangeable input capsules – X/Y, MS, Shotgun, and Dual XLR/TRS Combo – make the H6 the ultimate chameleon of the audio world, and its advanced preamps make it the best-sounding one too. Whatever your application – live recording, professional film/video work, live broadcast or electronic news gathering – the H6 can handle it with ease. In particular it’s all that post-production and mixing potential that you’d find useful. You can record with up to six microphones. If you have a spacial audio setup in mind, this is your recorder. To give you an idea of what this magical box of tricks can do, I have the charismatic Ray Ortega here to give you a run down. I went searching for intrepid ASMRtists making use of all this power at their fingertips, yet, so far all I’ve seen has been a lot of ASMR videos that use the Zoom H6 simply as a stereo microphone to tap on (and yes, it sounds great). What hasn’t been tapped is the full potential of the Zoom H6. Perhaps you are the ambitious ASMRtist who will change that. Direct recording to SD cards up to 128GB. Display 2.0-inch full color LCD (320 x 240 pixels). Gain knobs, pads, and phantom power for each input. Maximum Sound Pressure Input: 122 dB SPL. Newly redesigned preamps with an ultra-low noise floor, up to 24-bit/96kHz audio in WAV or MP3 format. Mountable directly to DSLR or camcorder with optional HS-01 hot shoe mount adapter. Multichannel and stereo USB audio interface for PC/Mac/iPad. Includes: owners manual, XYH-6 X/Y capsule, MSH-6 MS capsule, AA size LR6 battery x4, USB cable, sponge windscreen, cubase LE software, case. Overall the Zoom H6 is probably the best microphone recorder there is on the market. Buyers agree. As I write this the H6 by itself is listed as an Amazon #1 Best Seller. It’s highly praised wherever you look. An incredible machine. You’ll love using it. There are a few bundles available, the best looking one being the bundle that includes the accessory pack of a furry windshield, remote and power adapter. I had to try very hard to contain my excitement for these microphones when I first discovered them. Hooke began as a humble kickstarter project, which is surprising right? Their journey sounds amazing. In short (tl;dr) a few audio professionals spotted a niche and now here we are. Hooke Audio has a website with a mountain of information and a pretty cool blog. I went over to Amazon to see what else Hooke had to say about their incredible binaural headphones. Hooke Verse is a pair of Bluetooth headphones that incorporate binaural microphones designed to capture 3D audio to any device. Specially placed mics allow you to capture sound like you actually hear it. Once captured, Hooke Verse’s 3D audio can be experienced on any pair of headphones or two channel system, no special speakers or algorithms required. Your listeners will feel like they’re there. With the free Hooke Audio mobile app, you can capture 3D audio wirelessly to your iOS or Android device using Hooke’s proprietary bluetooth recording codec. With the Hooke Audio recording cable, you can capture 3D audio to any device, even if they don’t have Bluetooth, like DSLR cameras, GoPros, Field recorders and more. Right. These microphones look a lot like regular in-ear headphones. They are way more portable than a bulky 3Dio, so if you wish to wear a pair of binaural microphones and capture an ASMR experience “out in the field”, this is the type you could use. One of the biggest selling points of the Hooke Verse is the simplicity compared to other lightweight microphones that demand additional power sources from accessories or field recorders. These puppies just plug right into your iPhone and you’re good to go. That’s it. Just your phone and these. And sure, they work with lots of your other devices too. So convenient. 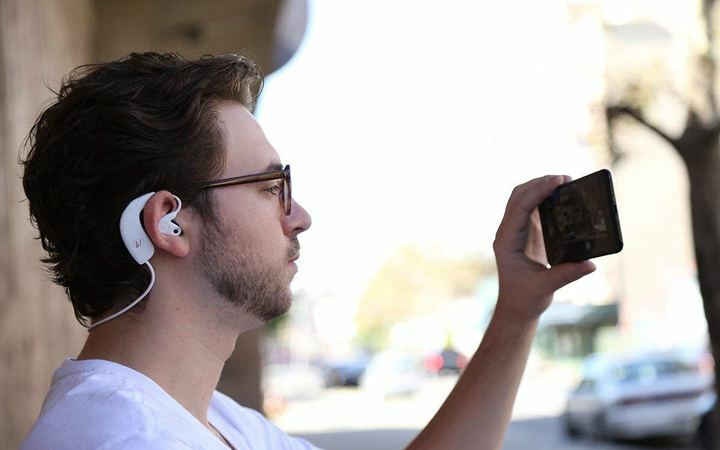 Record binaural 3D Audio Wirelessly on any iOS and Android Device or pair Hooke Verse with your DSLR, GoPro, 360 Fly and other VR capture cameras for a fully immersive experience. Free Hooke Audio recording app with sound filters, public feed, “selfie mode” specifically designed for the Hooke Verse. 3D audio playback can be enjoyed by anyone on standard headphones or stereo speakers so you can easily share your immersive audio creation with the world. Compatible on: iOS (Apple MFI Certified), Android, DSLR, GoPro, Field Recorder, Pro Video, Pro Audio. This is perfect if you want to record a haircut or a scalp massage out somewhere, go walking around in a crowded place sharing your experience, being in nature or basically anything where you want to capture the experience that you are having, right now. If you want to be outside recording experiences then this is your microphone. Yes there are competitors to the Hooke Verse, but I can’t recommend any that I’ve seen. 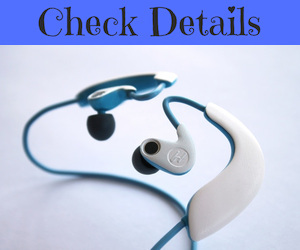 Overall the Hooke Verse must be the best binaural microphone headset on the market for all around ease of use and quality, made by passionate audio experts for professional use. Owning the best is just a few clicks away. The above link is to the black model and this next image is to the white model. Hooke Verse Founder Anthony Mattana wearing the white headset. This is the most famous “one with the ears” out there. You’ve seen it and love it. What list would be complete without a 3Dio? No list, that’s what! 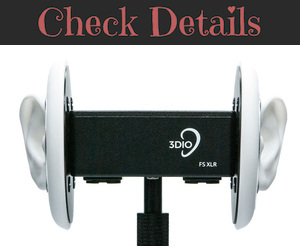 The 3Dio is the juggernaut of the ASMR scene, with girls everywhere fiddling with its ears, poking things inside them, tapping on the casing and God knows what else. It’s everywhere! Some say it’s overrated yet the popularity of this microphone is undeniable. Poki ASMR will introduce us to the 3Dio Free Space. The human-like arrangement of the microphone makes it very easy to relate to and interact with, as if it were another human being. Yes, it’s so easy to create your own head fantasy when the microphone is already so human, and that’s what I like about it too. If you dream about those things then you’ll love this microphone. There are actually three models to suit both your needs and your budget. Okay then, the three versions 3Dio make are the FS, FS XLR (both with white ears) and the FS Pro II (which has black ears). The ones you and I will likely be most familiar with are the white-eared FS/FS XLR models since they’re both a lot more affordable. The Free Space/XLR/Pro II captures sound just like we hear sound in the real world with our own ears. When you listen to a recording captured with the Free Space using headphones or 3D capable speakers, you hear the sound as if you were there at the time of recording. The effect is so powerful because the Free Space/XLR/Pro II design is based on 13+ years of research into binaural technology and human hearing. The Free Space/XLR/Pro II comes standard with a 5/8″ microphone stand adapter installed in the base. The microphone stand adapter is removable. The base of the microphone has a 1/4″-20 female thread mounting hole that can be connected to a hot-shoe adapter or used to mount directly onto a tripod or grip handle. The Free Space/XLR/Pro II contains a 9V alkaline battery within the chassis. The exchangeable battery is used to power the microphone capsules. 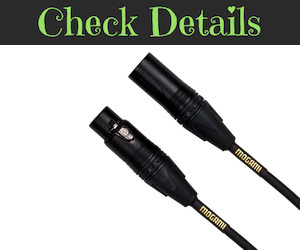 Every Free Space microphone ships with an 8″ long 3.5mm (1/8″) stereo TRS M2M cable. All Free Space microphones include the polyurethane ears. No need to purchase the prosthetic ear accessory. The output of the Free Space binaural microphone is a stereo 3.5mm (1/8″) output jack. Simply plug it in to your favorite stereo audio recorder or microphone pre-amp, and start recording true binaural audio. This upgraded version of the Free Space includes two balanced stereo XLR outputs that support phantom power. Power the Free Space XLR/Pro II using the 48V supply from a pre-amp, digital recorder or mixing console. The Free Space XLR/Pro II also includes an 1/8″ stereo jack output that is powered by the internal 9V battery. The phantom power works regardless of the state of the 9V battery. Okay so that’s a mashed-up overview of the three microphones, let’s take a closer look at each one. We’ll start with the base model you saw in Poki ASMR’s video above, the 3Dio Free Space. The Free Space binaural microphone is the most affordable, high-quality binaural microphone on the market. The integrated Primo EM172 microphone capsules are extremely sensitive and quiet. The EM172 capsules have a very natural presence, perfect for binaural recordings. The Free Space delivers portable, professional quality binaural in the palm of your hand. The Free Space has a very warm and solid response in the low to mid-range frequencies. This brings out the punch as well as provides low-end support for bass-heavy sounds. The frequency response of the EM172 capsules used in the Free Space rolls off slightly above 10kHz. This is excellent for recording instruments with loud high frequencies like drum cymbals or strummed acoustic guitars. It also prevents any harsh effects that are sometimes associated with binaural recordings using smaller capsules. The microphone works well in windy conditions even without protection. 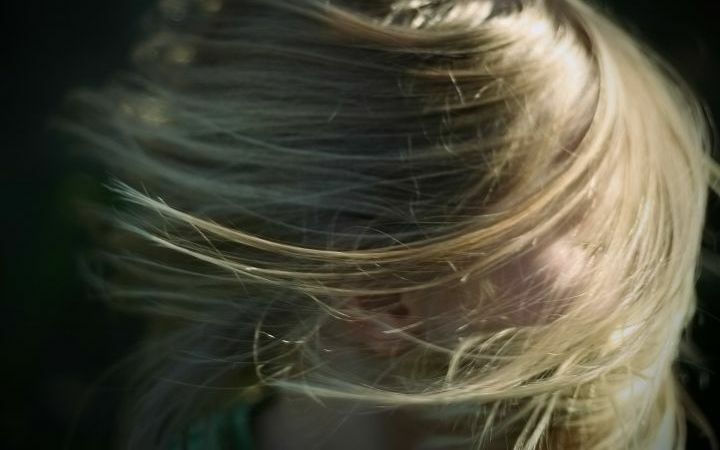 Wind sounds realistic without affecting the binaural experience or overloading the microphones. The Free Space uses matched Primo EM172 hi-sensitivity capsules. This is the microphone from the Poki ASMR video from a little further up if you want to listen to it in action, and as you’ll hear, even the base model sounds amazing. Millions of people have enjoyed listening to ASMR videos made with these microphones now. You know it’s a good choice. This microphone doesn’t have XLR outputs like the later versions, which means no need to worry about extra hardware to supply phantom power. If you don’t want the extra fuss and expense of XLR then this is your microphone. Yeah okay, the 3Dio Free Space XLR has a “hotter signal”, but what does that sound like? Stronger and cleaner. We’ll look at what else 3Dio has to say about their upgraded microphone, but first, here’s Dana ASMR with something to listen to. You can see the two XLR cables either side of the central stand. The 3Dio Free Space XLR Binaural Microphone is a high-quality binaural microphone. The integrated Primo EM172 microphone capsules are extremely sensitive and quiet. The EM172 capsules have a very natural presence, perfect for binaural recordings. The Free Space XLR delivers portable, professional quality binaural in the palm of your hand. The Free Space XLR has a very warm and solid response in the low to mid-range frequencies. This brings out the punch as well as provides low-end support for bass-heavy sounds. The frequency response of the EM172 capsules used in the Free Space XLR rolls off slightly above 10kHz. This is excellent for recording instruments with loud high frequencies like drum cymbals or strummed acoustic guitars. It also prevents any harsh effects that are sometimes associated with binaural recordings using smaller capsules. This upgraded version of the FS Microphone includes two balanced stereo XLR outputs that support phantom power. Power the Free Space XLR using the 48V supply from your pre-amp, digital recorder or mixing console. The Free Space XLR also includes an 1/8″ stereo jack output that is powered by the internal 9V battery. The phantom power works regardless of the state of the 9V battery. The Free Space XLR uses matched Primo EM172 hi-sensitivity capsules. So, a near-identical description to the earlier model and yet $300 more. What do you get for the extra money I hear you ask? Well it’s all about that XLR phantom power giving the microphone extra juice for a stronger signal. To supply the juice the microphone needs requires some extra hardware. This can be, for example, a recorder such as the Zoom H5. See Recorder Microphones if you need help with that. Notice that there is still the 3.5mm stereo jack on this microphone, as there is on the standard model. The FS XLR gives you flexibility and power. Yes, the 3Dio FS XLR microphone sits in that sweet spot of price versus capability: more potent than the standard FS, yet much cheaper than the FS Pro II. It could be the smartest choice. Is this your microphone? Owning it is just a few clicks away. The 3Dio Free Space Pro II is the ultimate beast in the 3Dio lineup with those upgraded microphone capsules for ultimate sensitivity and XLR outputs for the cleanest sound. Obviously the first thing you want to do is listen to them, so here’s Ppomo (Tomato!) with a demo. Note she’s using what looks like professional Mogami XLR cables to preserve that clean audio. The 3Dio Free Space Pro II comes with two matched, integrated DPA 4060 capsules mounted at the opening of the ear canal. The Free Space Pro II delivers a very sensitive and natural binaural recording. The extremely low noise floor of the DPA 4060 capsules results in a very open and dynamic binaural realism, especially during very delicate recordings. This sensitivity, coupled with the wide dynamic range of the microphone capsules, makes the Free Space Pro II ideally suited for professional studio recording and high-end recording binaural capture. The quiet ‘openness’ of the mic is great for field recording as well. This upgraded version of the Free Space includes two balanced stereo XLR outputs that support phantom power. Power the Free Space Pro II using the 48V supply from a pre-amp, digital recorder or mixing console. The Free Space Pro II also includes an 1/8″ stereo jack output that is powered by the internal 9V battery. The phantom power works regardless of the state of the 9V battery. The Free Space Pro II uses matched DPA 4060 hi-sensitivity capsules. Wow. Okay then. The 3Dio FS Pro II pulls out all the stops to give you the absolute best results and the highest sensitivity to sound. Is this your microphone? Owning it is just a few clicks away. Like the 3Dio FS XLR earlier, you’ll need a source of phantom power to provide this microphone with the extra juice it needs. 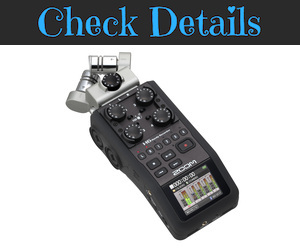 That means an additional piece of hardware such as the Zoom H6 recorder microphone. See Recorder Microphones if you need help with that. In case price is no object and you’re still stuck deciding between the three microphones, take a look at 3Dio’s User Guide. You get all the details there. Most buyers are probably looking for the FS or FS Pro. The FS Pro II is for the ultimate users with too much money on their hands. Oh, and don’t forget to use good cables. Although I’ve found some to recommend I’m not completely done here. I hear several well known ASMRtists are using these Rode microphones and unless I’m very mistaken you can listen to their exceptional quality in both this Massage ASMR video and this Ppomo video, remarkable as she’s usually such a 3Dio addict (or it could be the Rodes are usually off-camera when she uses them and this is a rare glimpse). The audio quality in both videos is incredible, clear and crisp like you’re really there. Massage ASMR talks about how he uses these mics right here. Both of these artists have years of experience and really know what they are doing, so you already know these microphones are worth a closer look. Considering this is a pack of two high quality microphones, it’s remarkable that the price is lower than the entry-level 3Dio. Of course there are no ears to play with, but you hardly need them for the vast majority of ASMR scenarios. Roleplays, hair brushing, you name it, you can get exceptional audio quality with a pair of matched condenser microphones. The NT5 is RØDE’s premier small-diaphragm cardioid condenser microphone, sometimes referred to as a ‘pencil mic’. Intended for recording acoustic instruments, drum overheads, cymbals and live performances, the compact externally polarized mic employs a 1/2′ capsule, an active J-FET impedance converter with bipolar output buffer. 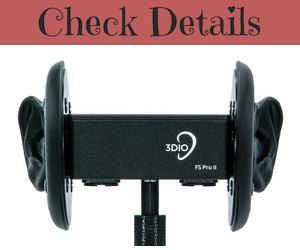 Its tight cardioid pickup pattern also makes it ideal for use as an indoor dialogue microphone for filmmaking on a mic stand or boom. Expanding the NT5’s versatility, an interchangeable omnidirectional capsule (NT45-O) is available. 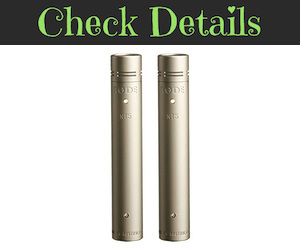 Finished in durable satin nickel, the NT5 available as a single microphone or as an acoustically matched pair. For applications that require a single or stereo X/Y mic setup, the RODE NT5 is an excellent choice. The NT5 matched pair comes supplied in a custom carry case with windshields and mounts. As you can gather from Rode, the fidelity is very high and intended to faithfully capture every detail of sound. Perfect for ASMR as you can hear in the above videos. Also very handy are the included windshields and mounts so you don’t have any hidden costs from buying those accessories. What you will need is a recorder to plug them into. Check out Recorder Microphones if you need help with that. You might also want to look at Microphone Extras for proper cables etc. Used by Gentle Whispering ASMR (Maria). With this pair you can create amazing sounds for your listeners to enjoy. Maria can whisper behind your left ear for example and it’s really neat, like she is right behind you. Also, there is zero white noise with this setup, just perfect silence and crisp sound. Take a listen. The comments on that video are funny because someone suggested that ASMRtists make the best mic testers and maybe that’s true! Okay then, let’s look at what Sennheiser have to say about their excellent MK4 microphone. Professional quality cardioid condenser microphone for home, project, and professional studios. A 1” true condenser capsule produces powerful warm sound. Highly sensitive. Ideal for vocals, and acoustic instruments. The MK 4 is a large-diaphragm true condenser microphone for professional studio recordings. Featuring fine resolution and outstanding sound quality, the MK 4 is easy to handle and excellent value for money, making it an ideal choice for professional project studios and home recordists. It features a 1″ true condenser capsule based on the acoustics of the e 965 high-end vocal mic, optimised for recording. Pretty good right? These microphones are very highly rated at nearly 5 stars on Amazon, which is amazing. It shouldn’t take you any more convincing that the MK4s are incredible mics for ASMR, and if it does, have another listen to Maria’s video above. Perfect. You can have these mics for yourself with a few clicks and you’ll love them. Don’t forget that you’ll need something to plug these mics into. 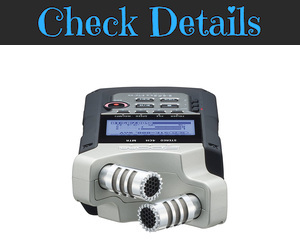 Check out Recorder Microphones if you need any help with that. There are also some common extras worth looking at in the Microphone Extras section, such as proper cables etc. 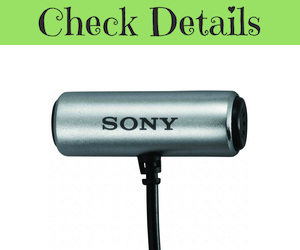 This tiny stereo microphone from Sony has been on Amazon since 2011. As such it’s become a highly reviewed mic. With an average rating of 4.2 out of 5 and great reviews, none of the competition comes even close. It really is an impressive sounding microphone for so little money. So what does it sound like? 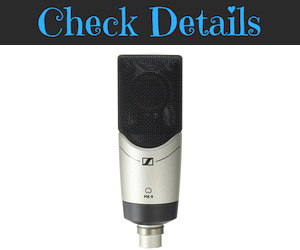 Heather Feather demonstrates this microphone for you in her microphone roundup from 2015. Heather mentioned she used this mic in a Bob Ross role play, and if that got you curious, the video is linked. She also uses her 3Dio in that video though so it’s hard to tell which mic you’re listening to. They both sound great, which is funny since one mic is ~$18 and the other is at least ~$499. Can you tell the difference? 50Hz – 15,000 Hz frequency response. L-shaped gold-plated stereo mini plug. Overall then the Sony ECMCS3 is the best little mic you’re going to pick up for the money. You’ll love what it can do for so little. Interested in the next step up? The next microphone actually worth bothering with is probably a Blue Yeti for ~$129. If your budget doesn’t quite go that far then try the ~$55 Blue Snowball. For specific microphones I’ve already tried to include the most relevant extras, although more generally there are other items that you might find essential. These include professional cables for your XLR mics, pop filters, windscreens, shock mounts, booms and stands. These are for microphone matched pairs, such as the Sennheiser MK4s used by Maria of Gentle Whispering ASMR. She uses a pair of 6ft Mogami cables for hers. Massage ASMR uses the same brand. Remember, there’s not much point in having amazing mics if the cables are going to introduce noise or degrade quality. These cables are available at 2ft, 3ft, 6ft, 10ft, 15ft, 25ft, 50ft, 75ft and 100ft lengths. The price ranges from ~$39 to ~$190 each. They have a great product description on Amazon and are a must buy for serious mic users. Rated 4.5 stars and awarded Amazon’s Choice. Great, right? Expensive perhaps, with good reason. Think about it, if you’re buying quality mics already then you need to have quality cables for them to preserve the audio. They’re a no-brainer. And don’t forget to buy a cable for each microphone that needs one. Small item with a big effect, pop filters and windscreens shield the mic from distortion effects caused by wind, breath, or speech. You normally just choose one type. Are they relevant to a whispering ASMRtist? Absolutely. Meanwhile a shock mount helps to keep vibrations out of your recordings. Sometimes a shock mount already has a pop filter attached to it. These give you something to help you position your microphones where you want them. Pick whatever suits your environment. Sooner or later you’ll be listening to microphone noise. Static, buzzing, humming. What you wanted was clean, crisp silence. Or maybe the problem is the sound blowing out due to breath or plosives. What to do? Usually to do with the microphone’s noise floor, which you might be able to avoid by playing with volume levels. If you are boosting the volume of very quiet sounds, there is a higher chance of static noise becoming noticeable. Ground loops are a problem for audio recording because they’re a source of buzzing. That’s what your domestic mains power supply sounds like when it interferes with your microphone through a ground loop. Basically, if you plug all your gear into the same power strip then you should avoid any problems with ground loops. Another problem I came across was inadequately shielded mics picking up electrical interference from lights and other electronics on mains power. The sound was a more muffled humming noise, unlike the sharp buzzing of a ground loop. The Sound Professionals Master Series binaural microphones had this problem on Heather Feather‘s channel due some electronics in her setup. I suspect it was Heather’s “beauty ring” light. The mics should be fine in natural lighting or some soft, ambient candle light. Just don’t use certain mics near electronics on mains power basically, or alternatively get them some better shielding from electromagnetic fields. The wind, breath, and certain spoken syllables (plosives, such as the letter “P”) can cause sounds that spike your microphones. Pop filters and windscreens should do the trick for you. While tapping on the microphone is something that an ASMRtist would usually like to record, there might be other bumps, knocks and vibrations that are unintended. This is what a shock mount is for. The camera you use for ASMR isn’t usually as important as the sound equipment, although if you notice there are ASMRtists who use a lot of visual triggers in their work. Because there are so many good cameras, the best one could already be the one you own. However, if you know it’s something you want to upgrade then here are a few that are jumping out currently along with some decent tripods to mount them on. Cameras can get ridiculously expensive if you’re not careful and at the end of the day why do you need a $5,000 camera to make the best ASMR? You don’t. As long as you have something decent that fits the aesthetic you’re going for then you’re golden. In fact your camera quality might even give you ideas like lo-fi role plays or whatever. Should you be dissatisfied with what you’ve got, take a look through the following cameras and see if anything jumps out as matching your requirements and budget. There are some good cameras out there for not too much money. And then of course there are monster cameras out there for a mountain of money. Okay first up, why do you even need a “real” camera anyway? Real cameras are for chumps! Check out Kai’s tips for shooting on your phone, and then I’ll mention some extras for ASMR. See? The picture was already pretty decent, and all Kai needed to fix the awful audio quality was a small mic like the ~$18 Sony ECMCS3 from earlier. 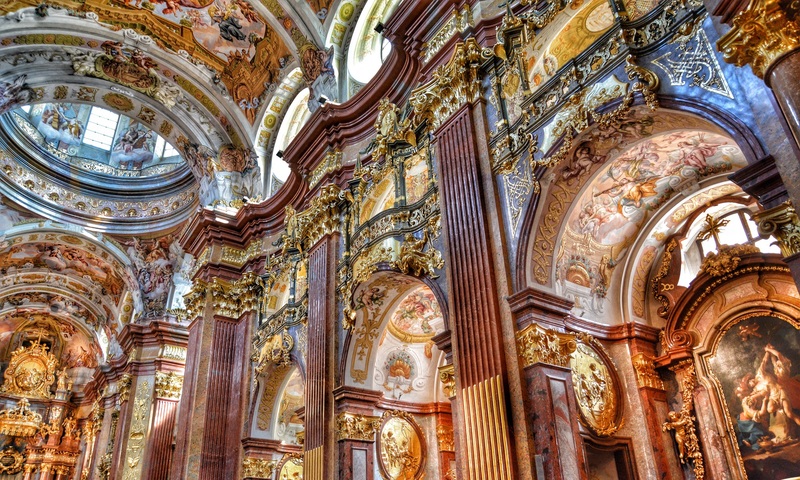 Aside from that you might only need a decent mount and tripod, and those happen to exist. The little Manfrotto Pixi tripod is already brilliant. What makes it even better for smartphone users is the smartphone clamp for using your smartphone as a properly stabilised camera, and of course the uses for that go way beyond recording the best ASMR. 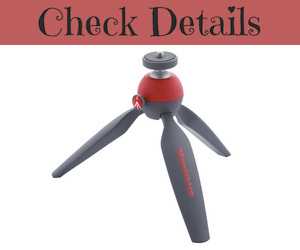 Can be used as a tripod or grip. Pixi can also be used with huge variety of digital devices thanks to standard 1/4 mount. Yes, that standard mount means it’s useful for all sorts of devices. Mainly cameras though obviously. 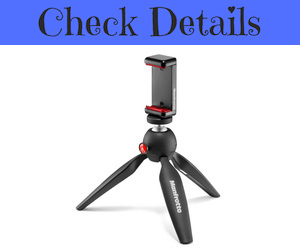 Manfrotto make great tripods and you will love yours. I own one myself and I love it. And if you just want the clamp, that’s possible too. This is a USB camera and it’s another camera that I both own and spent ages researching before buying. Very good price, built in mics, many uses. A great camera for Skype, video streaming and video blogging too. The mics are not bad for chatting, they might be okay to play around with too if you fancy tapping or brushing them. Full HD video recording (up to 1920 x 1080 pixels), H.264 video compression. Compatible with: Windows 7, Windows 8, Windows 10 or later, Mac OS 10.6 or later, Chrome OS, Android v 5.0 or above, USB port, Internet connection. Overall it’s a solid choice at an excellent price. 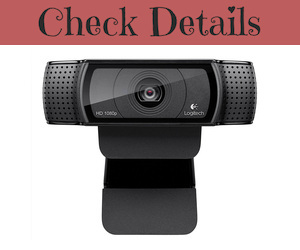 If you want a good USB webcam you’ll love this. You can also mount this camera on a little Manfrotto Pixi tripod. You can mount all sorts of cameras on this tripod, like a DSLR. Plus, after you collapse the legs together, you can also use it as a grip and go walkabout. It’s very comfortable, solid and stable. Yes, I own one. It’s great. Rapid push button lock system for head adjustment. More research required, although feel free to search. If you already own one, use that. My first DSLR camera, bought in early 2017. I spent ages researching this to find the sweet spot between price and performance and the Canon 700D was the clear winner (at the time). In the USA this camera is known as the Rebel T5i. The Canon 700D is a mid-range DSLR camera and it’ll have you skipping right over the “entry level” ones straight to something decent. Nice! The irrepressible Kai will give you the lowdown on this one. Thanks to DigitalRev TV and Kai W.
As I said just before the video, this is a solid choice DSLR that balances the price against a decent performance. The most important part of the DSLR is the lens you put on it anyway. Keep some spare cash for those. They can get expensive. 18.0 Megapixel Hybrid CMOS AF sensor. Creative Full-HD movies and Hybrid CMOS AF. Vari-angle 3.0″ Clear View LCD II Touch screen, Scene Intelligent Auto. ISO 100-12800 sensitivity, expandable to ISO 25600, 7 Creative filters with live preview. 5 fps shooting 9-point AF system, EOS System of lenses and accessories. So, this camera came out in 2013. Is it still relevant? Being a mid-range choice it’s all about compromise anyway. The Canon 700D remains a solid choice for the money and it’s a highly rated camera for what it is. I’ve very much enjoyed owning mine and you’ll enjoy owning yours. Maria (Gentle Whispering ASMR) has used this camera for many of her videos and it’s very impressive. It’s the step up from the one previously and as such it’s better and costs more money, although it is still in the mid-range for a DSLR. So, not too crazy. Remember this video? Maria is showing off her new Sennheiser MK4 microphones while filming on a Canon Rebel 7Ti. While last time you were probably concentrating on listening, this time check out the picture quality. Crisp right? Remember that this is “only” a mid-range camera and it looks great! Good lighting works miracles and so the best ASMR on YouTube is likely done on affordable mid-range cameras with decent lenses and nothing more. DSLRs are available in bundles to get you started all at once, or you can pick and choose exactly what you want with a little more effort. What’s clear is that the Canon EOS 800D (Rebel 7Ti) is a smart choice and you’ll love using it. You can buy the body by itself if you want to built it up yourself. The bundle Maria bought contains a whole bunch of extras so that you’re just ready to go. Hopefully. The Best Software for ASMR? Yikes. Well there is a lot of software out there, some rather expensive, some quite reasonably priced and others completely free. For all sorts of things. You might have perfectly good software for everything that you are doing already, but if you are looking for other ideas then here are a few that could come in handy. When I was looking into making YouTube videos for myself I was really keen to find some easy editing software that didn’t take a whole load of time to learn or use. I have used Blender, which is free, and I was aware of expensive options (Adobe Premier), but neither was ideal. I had my breakthrough coming across Elise Buch’s YouTube blogging channel where she introduced me to Filmora. Elise’s video goes over Filmora and she talks about her cameras and lights. Some very useful ideas and insights. So I bought the software and yeah, it’s really nice. Editing is easy. You can also use it to combine a video and audio track from different sources and sync them up, like if you recorded video on some camera device and separate audio on a recorder or with Audacity on some computer. You can even upload direct to YouTube right through Filmora, it’s really convenient. Free sound recording and editing software. It’s been around for ages and I have nothing extra to add, it’s well known and used for all sorts of things. Also ASMR apparently. This is a digital audio workstation (DAW) for Apple products, used for editing your audio. PC users can run it in an emulator or virtual machine, more details for that on wikipedia. Do you record on a PC with loud fans? Internal case fans create unnecessary noise when there’s often no need for them to run at full power. SpeedFan is some free fan control software for quieting those internal fans, should you have a problem with that noise showing up in your recordings, Skype calls and livestreams. You can remedy that noise a lot by using the SpeedFan software to smartly respond to computer temperature and slow those fans right down to a whisper. I set a minimum fan speed of 40% to ensure there is always some air flow even when the machine is idle as a precaution, especially for the CPU fan, although you might be able to stop some of the extra case fans when the machine is running cool. I did admittedly play with this software for couple of days to get it “just so”. After that I haven’t had to touch it since. It could be a bit daunting to non-tech savvy users, but then if you can edit videos together I think you can handle some fan settings. The official SpeedFan page is here and the download page is here if you want to give it a try, it’s completely free software but do read about it first. The wikipedia page lists some alternatives. Now, if you can’t get your machine to be silent and it’s a real problem for recording then I’d advise you to look at a recorder microphone. All you need to do is transfer the data over to a computer and then edit it together with your video track, which you can record separately on another device like a smartphone, DSLR or whatever. That’s the pro way. Okay well this guide certainly turned out waaaay longer than first anticipated. I added and dropped quite a few different brands and products along the way, so apologies if there was something you expected to be here and it wasn’t. Or did I miss it? Drop me a comment below if you think I did. Or if you just want to say “Hi!”, you can do that too. Please note that I will be updating this guide so items will come and go as new information comes in, plus there are still a few gaps that need filling in. Thanks for reading and watching and I hope all of this helped you to buy lots of stuff!